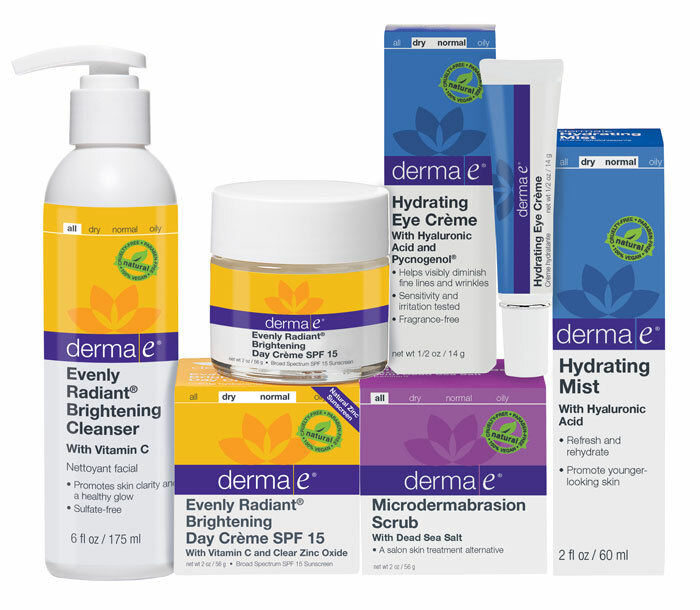 When I first started exploring cleaner, greener beauty in 2007, derma e was one of the first brands I found. Widely available and extremely affordable, derma e showed me that natural beauty products could be just as sophisticated, beautiful and effective as conventional products. I was impressed by how large the product offering was (seriously — age-defying, firming, hydrating, soothing, clearing — they’ve got it all), and how thoughtful the star ingredients in each collection were. Not to mention, derma e products are vegan, cruelty-free, paraben-free, sulfate-free, mineral oil-free, lanolin-free, gluten-free and GMO-free. That’s a hell of an introduction to green beauty, right? derma e set the bar high for me during my transition, and I’m excited to share a very generous giveaway with my readers — new to green, medium green and dark greenies alike — so that you can experience a little bit from this line. OK, actually, it’s a lot a bit. derma e is gifting three (3!) lucky kimberlyloc readers with five (5!) of its awesome products from its brightening, hydrating and exfoliating collections. Ready to enter to win? Use the Rafflecopter widget below to enter. Giveaway begins Friday, April 24, 2015, at 12:00 a.m. Central Time, and closes on Friday, May 1, 2015, at 12:00 a.m. Central Time. 2. Entrant must be 18 years old as of sweepstakes start date and a legal resident of Canada, the 50 United States and the District of Columbia as of start date. 3. Sweepstakes begins Friday, April 24, 2015, at 12:00 a.m. Central Time, and closes on Friday, May 1, 2015, at 12:00 a.m. Central Time.